“Congratulations! We’re excited to have you as our new handbell choir director. There’s not much to it, really. Just show up on Wednesday nights for rehearsal, pick out a few things to play in worship this year, and arrive a little early those mornings to run through your piece. Oh, and we’ll need you to recruit a few new members - we had a few people move out of state last year. Oh, and some of the bells may need repairing - ringers complained last year about a few odd noises. Yes, it’s true. If someone isn’t at rehearsal or isn’t able to be there on Sunday (especially when this happens at the last minute), you may be expected to take on the role of substitute ringer. This often means doing a combination of ringing and conducting from the front of the ensemble. Can you read the part and keep everyone together in a steady tempo? If the coordination of this is a little daunting to you, practice on your own during the week by choosing a piece in the folder, picking a part to play, and ringing and conducting in alternation. Obviously, when ringing, your arm and hand motion needs to default to proper ringing technique. The trick is to use your right hand to keep the beat pattern when that bell is not playing. Often, this is an unofficial (and often unspoken) part of the job. As handbell choir director, you may be responsible for moving and setting up tables, pads, covers, and bells for rehearsal each week and before worship on Sundays when you’re playing. You may be able to recruit the help of some of your able-bodied members, but this does require them to arrive 10-15 minutes before rehearsal so everything is set up and ready to go when your rehearsal is scheduled to begin. Your church may have a facilities person on staff who can help with moving and setup, as well. If so, make sure to communicate your setup and breakdown needs in advance, so people can plan accordingly. For bigger, more involved repairs and refurbishing, you’ll want to send your handbells out to a specialist. But, for smaller clacking noises, loose clappers, and voicing, you may be the person people look to for help. Most of these things are quick fixes you can do with a screwdriver or an Allen wrench. Malmark has a short, helpful video series on caring for your handbells- a great way to learn how to make some of these adjustments yourself and knowing what to listen for in rehearsal. This is often a component that gets left out of job descriptions but is very much a part of the leadership position, if you’re working in a church setting. A musical ensemble in a church setting often becomes a small group, of sorts - a community of people that come together every week to learn and work together toward a shared goal or purpose. As the director, you become the guide, the mentor, and the spiritual leader for this group. It’s you who shepherds the group through the year, prays with them in rehearsal and before playing in worship, builds community with them, and talks about what worship is, what it means, and their role in it. Though it may not be specifically outlined in the job description, this is a significant and very important part of your work as a handbell choir director. It’s fairly likely that you’ll have people in your bell choir who can't read music (at least at some point in your career), or someone who can only play C5, or people who can't remember which hand is right and which one is left (true story). If you’re working with beginners, or you’ve recently recruited a few brand-new ringers to your group, you'll be expected to teach the basics of music-reading plus all the special techniques that go along with handbell-playing to ringers with varying abilities. What’s a handbell choir director to do? No. 1 - Focus on the three “P’s"
If you’re new to ringing handbells, set aside some time during the week to do a little sight-reading on your own. Pick a part and play through one of the pieces you’ve chosen for your group. This will help you relate to your beginning players and anticipate challenges they may have. Likewise, if conducting is new for you, practice the various beat patterns you need to learn in front of a mirror before rehearsal. Always make a point to plan ahead. This means choosing music that ties in with worship services in the coming months, picking out a few others pieces to learn and rehearse just for fun, and planning out how you’ll spend your rehearsal time. Be sure to include a few activities that will help develop your ringers’ musicianship, reading, and coordination skills. And finally, prepare. Prepare your rehearsal space: make sure you have enough pencils and copies of the music on hand and that everyone has a pair of gloves. Prepare to lead, direct, and teach by reviewing the music in advance - looking for signs, symbols, and special techniques you can teach - and going through your rehearsal plan once more. We’re never done learning, and that goes for teachers and directors, too! If you feel like a newbie when it comes to leading and directing and the idea of being a music educator feels beyond your realm of expertise, you’re not alone. In fact, that’s why I created my newest online training course: Music Education & Leadership Skills for the Handbell Choir Director. This course will help you develop valuable teaching skills (tailored to adult learners and informed by three useful educational frameworks) and equip you with the practical tools and skills you need to lead and teach your handbell choir with creativity and confidence. Enrollment is officially open and I’d love to have you join me! You don’t have to do this work alone. Reach out to people within your ensemble, on staff, or within your congregation and invite them to be part of what you’re doing. Ask members of your handbell choir to pray at the end of rehearsal (ask them in advance to make sure they’re comfortable with this). Reach out to people in the congregation who you know have a little playing experience and can read music if they’d be willing to be substitutes during the year. Perhaps they have another commitment during the week that keeps them from joining the group, but they may be happy to step in for someone, as needed. Ask a few people if they’d be willing to come a little early and help you set up tables, pads, and bells. This will give you an opportunity to get to know your ringers a little better and build relationships in a more personal, direct way. Feel like you could use a team of music education experts in every rehearsal? In fact, that’s why I created Music Education & Leadership Skills for the Handbell Choir Director, a mini online training course just for handbell choir directors. This course will help you develop valuable teaching skills and equip you with the practical tools and skills you need to lead and teach your handbell choir with creativity and confidence. I’d love to have you join me! 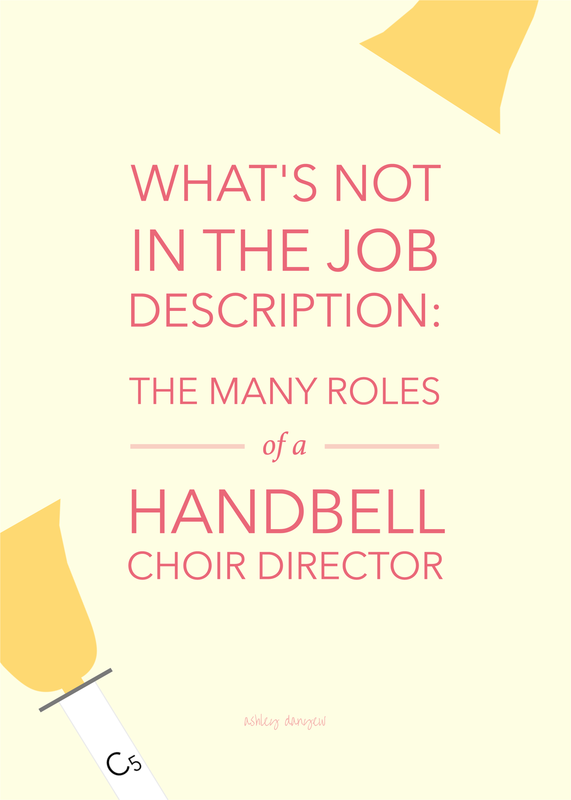 I’d love to hear: How to do you juggle your many roles as a handbell choir director? What are your secrets to success?